A sleeping Polar Bear in the Churchill Wildlife Management Area in Manitoba, Canada is a picture worth a thousand words but let it be known that they are still aware of their surroundings. Early in the bear watching season in the Churchill Wildlife Management Area near the Hudson Bay in Churchill, Manitoba, a sleeping Polar Bear is a common sight. This Polar Bear has awoken many times, but still feels the effects of the long summer months and is saving his energy for hunting. Between June and November, the Polar Bears are sleeping or resting until the Hudson Bay begins to freeze over. A Polar Bear can survive an entire summer without any food but by the time winter arrives around the Churchill Wildlife Management Area, these are very hungry animals. On average, a Polar Bear usually sleeps for a period of seven or eight hours at one time but unlike humans, this is done mainly during the daylight hours. A good reason for their sleeping habits is probably due to the fact that during the winter, ringed seals are livelier at night, therefore making them easier to catch. 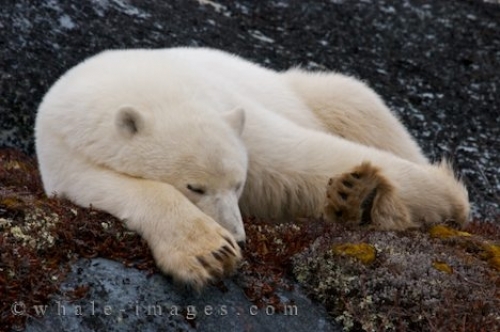 Long sleeping hours are often followed by naps as this is a favorite past time for a Polar Bear. It does not seem to matter where they are, a Polar Bear will nap at any given moment, especially after enjoying a good meal. Do not venture too close to a sleeping Polar Bear, as they are still very fast animals and when not in a deep sleep, can turn on a human within seconds. It is wise to keep your distance and admire the soft, white, cuddly ball of fur snuggled on top of the rocks while visiting the Churchill Wildlife Management Area in Manitoba, Canada from an enclosed vehicle.